The Ferry Building's restaurants, wine bar, and oyster bar spill out on all sides of the building. Generous sidewalks accommodate various simultaneous users. 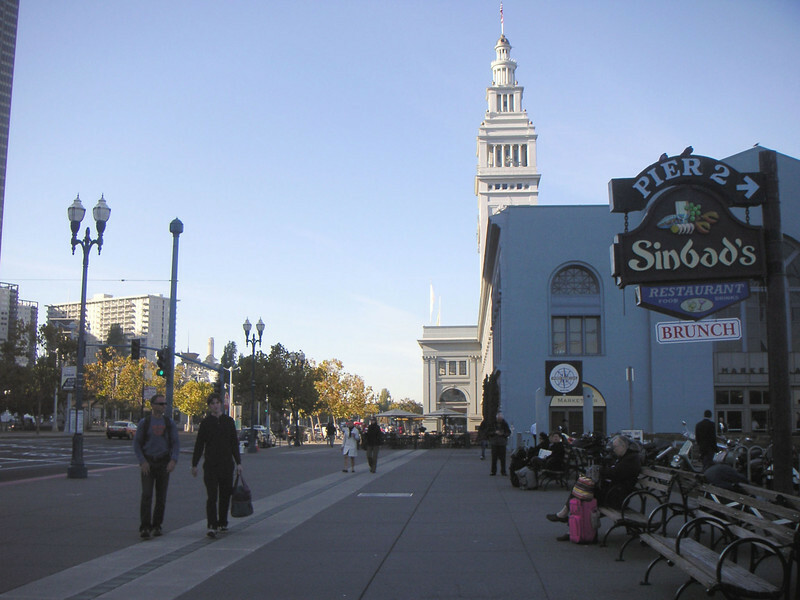 The Ferry Building, built in 1898, has survived two major earthquakes and is listed in the National Register of Historic Places. Though it is now a major inter-modal transportation center and mixed-use complex, it has not always been so. Until the opening of the Bay and Golden Gate Bridges in 1936 and 1937, respectively, the Ferry Building was the focal point of ferry and rail transportation. When auto travel became the dominant mode for traveling across the Bay, the Ferry Building became obsolete and was transformed into primarily office use. To make matters worse, the elevated Embarcadero Freeway was built directly in front of the building in 1957 cutting the building off from the rest of downtown. The 1989 Loma Prieta Earthquake instigated the redevelopment of the Embarcadero and the Ferry Building when it destroyed part of the elevated freeway. Two TE awards, procured in 1995 and 1998, were used to complete the Ferry Building Rehabilitation project. In total, State TE funding amounted to $2 million and generated a total local match of $2,201,000. Today, visitors and commuters from East Bay and Marin County can connect to downtown San Francisco via passenger ferries, light rail, the subway system, historic streetcars, cable cars, and buses. In addition, the Ferry Building is now truly mixed-use with retail shops, restaurants, food markets, conference center, and office space fill its historic space.